HOW I WON THE WAR - 1968 - ORIGINAL ONE SHEET (27 " X 41") MOVIE POSTER. POSTER IS IN EXCELLENT CONDITION WITH LIGHT FOLDS (AS ORIGINALLY ISSUED). THIS IS NOT A VIDEO OR REPRODUCTION POSTER , THIS IS AN ORIGINAL THEATRICAL MOVIE POSTER PRINTED BY NATIONAL SCREEN SERVICE. 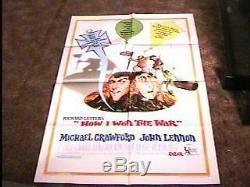 The item "HOW I WON THE WAR MOVIE POSTER'68 JOHN LENNON BEATLES" is in sale since Sunday, December 27, 2009. This item is in the category "Entertainment Memorabilia\Movie Memorabilia\Posters\Originals-United States\1970-79". The seller is "tloceposters" and is located in ROCHESTER, NY. This item can be shipped worldwide.